On March 2, 2012, a doula contacted me because a GBS positive client was seeking a VBA2C. Her OB group was supportive until they withdrew support of her VBA2C plans at 37 weeks due to factors that had nothing to do with her. I suspect that the OB group – who was known to be VBAC & VBA2C supportive – had a lawsuit/uterine rupture/bad outcome that made them so abruptly change their VBAC policy. Nothing developed during the mom’s pregnancy that suddenly made her a poor candidate for VBA2C. With the mom’s permission, her doula contacted me to help them determine their options. (Below you will find the initial email I received from the doula.) I’m not an attorney or a medical professional, so I could not advise them. I turned to Facebook to collect options and opinions. Through those posts, I was directed to people who could help them – OBs, midwives, reporters, legal organizations, and attorneys. Now it was up to the mom whether she wanted to contact those people/orgs to get their opinions and advice. Her name and her doula’s name were not made public so that the mom could make this decision without the public eye directly on her and all that comes with that. What follows below is a brief timeline of the events and then there are emails that follow sharing more detail. Update 3/3/12 12:08 PST- I contacted the National Advocates for Pregnant Women last night and the Executive Director Lynn Paltrow replied early this morning with lawyer referrals and a review of the case law. I have included her email below with her permission. This is good information for anyone who works with pregnant women. 1:01 PST- Mie Lewis of the ACLU Women’s Rights Project recently expressed interest in taking on cases like these. Mie Lewis is in New York city and would be an excellent resource for any other women who experience similar situations. Elizabeth Cohen, Senior Medical Correspondent for CNN and CNN’s Sabriya Rice are two reporters who have written about birth and might be worth contacting if you find yourself in a similar situation. Check out “Mom defies doctor, has baby her way” dated December 16, 2010 to get a feel for their writing. 3/5/12 6:40 PST – I learned last night that the mom was able to get her cesarean rescheduled two days later for March 7th. When the OB referenced ACOG’s VBAC recommendations and the fact that they do not support VBA2C, the mom asked for the date of the recommendations the OB was using. Turns out he was not aware, and was shocked to learn, that ACOG released a new VBAC Practice Bulletin in 2010 stating, VBAC is a “safe and appropriate choice for most women” with one prior cesarean and for “some women” with two prior cesareans. This is why it is crucial for women to be informed and resourceful! What if this mom was like most moms who choose whatever mode of delivery their OB recommends without understanding the risk and benefits of their options? She would have had a cesarean at 40 weeks per an outdated ACOG VBAC Practice Bulletin. Instead, the cesarean date has been moved back to 41 weeks (March 17th) and if mom doesn’t go into labor before that, she is OK with having a cesarean on that date. You can read the full letter from the doula detailing the pre-operative appointment below. 3/7/12 – I’m informed that the mom’s water broke and am in communication with the doula throughout the day. Several hours after spontaneous rupture of membranes, contractions start and labor progressed, but then fizzled out. “Dr S. decided that because she had come this far only to hit a wall that wasn’t moving after trying all natural approaches, he would start a very, very, very low dose of Pitocin [starting at 2 milliunits/hour with a maximum of 4 milliunits/hour] through her IV.” Things start picking up again, but then some fetal distress was detected and Pit was backed off and finally turned off completely. Fetal heart tones stabilized but at a lower baseline than before. Suddenly fetal heart tones drop and then disappear. A STAT cesarean is called, mom was put under general anesthesia, and within TEN MINUTES, the baby is born. Mom was fine as well. A placental abruption was diagnosed during surgery. An abruption is when the placenta detaches from the uterine wall before the baby is born. This deprives the baby of oxygen and mom is at risk for hemorrhage. Full abruption is very dire for baby. While there is about a 6% chance of infant death or oxygen deprivation after an uterine rupture (Landon, 2004), there is a 12% risk of infant death after a placental abruption (Ananth, 1999). That is a grim statistic. I am extremely thankful that this mom birthed where she felt safest which was in the hospital despite the many who suggested she plan a last minute home birth. While I am supportive of home birth and I myself had a home birth, that doesn’t mean that I think all complications can be easily managed at home. There are complications that are better served in the hospital environment. Had she planned a home birth, she could have been totally fine, transferred in time, or she could have had a bad outcome. The fact is, we don’t know. I do think women who have placental abruptions have better odds in the hospital. She is very thankful she didn’t take the suggestions of some – to call in an underground midwife, to have a home birth, to go to another state and deliver, to labor at home until she was feeling pushy. Any of those suggestions could have had deadly consequences for Emily and her baby. She is thankful that she was given the opportunity to attempt a vaginal delivery, and she is thankful that her body tried to labor. Ultimately though, she is so very thankful that there was an amazing medical team who jumped right into action and essentially saved the lives of both her and her sweet baby girl. She let me know that if she could go back in time, there is nothing she would have changed. I don’t think I would have done anything different. I might have said hey lets keep it [the pitocin] at two [milliunits] but hey it [the abruption] would have happened either way. It was God’s way of saying, hey this baby needs out and isn’t coming out the normal way. I let you try it now it is time for you to go ahead and meet her. Mom is up and around the day after surgery and not needing pain medication! Hopefully this means she will have one of those easy cesarean recoveries of which I am forever jealous! Baby is breastfeeding well. I wish this mom and baby a quick recovery and a happy, happy babymoon! I’ve received a few comments questioning the use of Pitocin in a VBAC and even some comments suggesting that if the mom was at home, the abruption wouldn’t have happened because she wouldn’t have had the Pitocin. In terms of Pitocin in VBAC moms: 99% of VBAC induced/augmented labors do NOT rupture (Landon, 2004). I haven’t seen rupture rates in VBA2C induced/augmented labors. With induction or augmentation, the increased risk of rupture comes from the drug and the dose. I do not know if the dose given to the mom is in the “danger zone.” I’d appreciate any studies that have measured Pitocin augmented uterine rupture rates and abruption rates by dose in VBAC labors. But please know, that most ruptures occur in spontaneous labors. Zwart (2009) is a Netherlands based study that included 358,874 total deliveries, making it “the largest prospective report of uterine rupture in women without a previous cesarean in a Western country.” It also differentiated between uterine rupture and dehiscence. Zwart (2009) “found of the 208 scarred and unscarred uterine ruptures, 130 (62.5%) occurred during spontaneous labor reflecting 72% of scarred ruptures and 56% of unscarred ruptures. 28 (13.5%) ruptures occurred during cervical prostaglandin induction. 22 (10.6%) ruptures occurred during oxytocin (Pitocin) induction.” 40% of scarred ruptures occurred during prostaglandin induction. Read more here. In terms of Pit causing the abruption, none of us know whether that is true to not. Certainly most women who have Pitocin do not abrupt. Further, people said that if she was at home, she wouldn’t have been augmented, and she wouldn’t have abrupted. None of us know that. Some people believe the myth that nothing can go wrong in a spontaneous “unmessed with” birth. That is a dangerous and false belief. All complications are not the result of “interventions gone wrong.” Sometimes you can do everything “right” and still have a complication/bad outcome. Here is one mom’s story of her placental abruption at home (trigger warning). She survived, her baby girl Aquila did not. I share this story solely to illustrate the severity of placental abruption and how having a competent care provider and immediate access to operating rooms, surgeons, and blood products can literally make the difference between life and death. Abruption can be a very serious complication. Most women who have home births will not have a placental abruption or any other complication that requires immediate access to surgery, but those who do will greatly benefit from a qualified care provide who can facilitate immediate transfer to a hospital. A quick google search found this study which found a slight increase of abruption risk per mode of delivery: 1.06% during the third cesarean vs 0.91% during the third vaginal delivery. I’d be interested in reading other studies people have handy. It did not control for induction or augmentation, so if you have a study that does control by drug and dose, please share. According to ACOG, prior low transverse c/section is not a contraindication to induction (other than the use of misoprostol [Cytotec]) so a foley balloon or pitocin may be used safely in these women. The problem arises when a practitioner does not believe in doing inductions on women with prior c/section. Despite the evidence and the ACOG clinical guideline the reality is that many doctors will just not want to deal with it. I actually was impressed that the OB gave the mom the option of a gentle augmentation. It’s certainly better than just saying, “Your time is up.” I don’t know if I would have made a different choice being in this mom’s position: VBA2C, GBS+, contractions sputtering out… It’s really hard for me to say what I would have done. Yet it has seemed very easy for people sitting at their computer the morning after to make judgements as they do not have to deal with the real risks or consequences. Sometimes you can do everything “right” and still have a bad outcome. Fortunately, the abruption was detected, surgery was performed, and everyone survived. 3/2/12 – [This is what I wrote upon receiving the doula’s initial email.] I just received this email tonight and need ideas quick. This term mom seeking VBA2C is in the the Columbia area of South Carolina. Her OB was supportive until 37 weeks. Her cesarean is scheduled for March 7, 2012. She was told that if she shows up in labor, she will be “forced” to have a cesarean. Does anyone know of a care provider in her area that would be willing to accept a new client this late in pregnancy? What other options does she have? Additionally, I’m looking for information on the legality of a hospital/OB “forcing” a c/s? What happens if she shows up at the current hospital and refuses to sign the c/s consent form? What exactly CAN they do?? I need some quick help with a client of mine and was wondering if you’d lend an ear and offer up any words of wisdom as I know you are an amazing resource to VBAC. I have a client who is due today. She had a primary c/s 4 years ago exactly on her EDD for a breech baby. She had a RCS 15 months ago because she was carrying twins. She is seeing the same practice who did her first two c/s, so they are well versed in her medical history. She had double layer sutures both times, good space between deliveries, deliveries were due to breech & twins and not FTP, CPD, ect… She was deemed a good candidate for VBA2C and has been planning once since. At her 37wk check-up, the OB told her that the staff had changed their minds and could no longer offer her a VBAC. She questioned the reasoning and he said it was just too risky. She was completely blindsided by this and broke down crying – the OB left the room. Back to her 38wk appointment and she found out the OB had scheduled her RCS for 2 days after her EDD. She confronted the OB (this time a different one than she saw the week prior) and the OB said she didn’t see any reason why she couldn’t be offered a TOLAC. Relieved, my client went on about her business. Pregnancy has been great. Minimal weight gain, no GD, BP always great. She is GBS +. She received a phone call two days later and the OB said each OB on staff had met and it was decided that a VBA2C was too risky and she wouldn’t be allowed to have a TOLAC. My client was furious, and rightly so. She tried to get in touch with the OB but played phone tag back and forth. Her 39wk appointment came – this time with a different OB yet again. He was a total jerk. Laughed when she told him she wanted a chance to labor. She showed him the current ACOG guidelines which support VBA2C with the right circumstances (which she has) and he disregarded it and showed her a paper on the risk of VBAC. She argued yet again and said she wouldn’t consent to a c/s unless she or the baby were in danger. He told her that if she showed up to L&D in labor they would “force” her to have a c/s. Yes, he actually told her they’d “force” her. She left a crying, hurt, furious mess. She hasn’t been back since but has a section scheduled for the 5th that she intends to cancel. I am virtually her only support. Her MIL has 2 c/s, her mother had 3 c/s and thinks she’ll die if she attempts a vaginal birth. Her husband says he has to know when the baby is coming so he can plan to get off of work – so he is fine with the section and not supportive or helpful much. We have had massively long talks over the past few days and what it boils down to is that she has two choices essentially. #1 – Show up in labor at her current hospital and have to fight like hell to be able to labor. Almost certainly have the OB on call make the process very difficult. She voiced a concern that the OB may be so pissed off that she’s refusing a c.s that they’ll find some reason to section – “fetal distress”, baby too big, baby not fitting, failure to progress, ect… She also worries exactly what they truly mean by they’ll “force” her to have a c/s. She worries they’ll do something extreme like call DSS/CPS. She’s heard a horror story of a court-ordered c/s. I told her that all that worry, stress, and anxiety during labor will do absolutely nothing good for her well being and progress. #2. Show up at a different hospital and deliver with the hospital OB. Problem here is she has no record of prenatal care, no surgical records to show suture status, time between sections, ect… She requested her records from the current OBs office, but no one is getting back to her (and I doubt they will…). I know they’ll look down on that and potentially try to coerce into a section due to that. She feels she’d face the least opposition going this route, but has concerns. I’m exhausted and so is this mama. She is still firm in her choice that a VBAC is the best and safest option for her and her child and I fully support that. I’m not even sure what the right option is at this point or where to turn or what to do. I’m trying to let the mama guide but she’s looking to me as if I can somehow make this entire situation go away… I wish I had the answers, but I don’t. Thank you for listening, I know it was so long..
By this email,I am cc’ing two lawyers in South Carolina, Susan Dunn and C. Rauch “Rock” Wise, and SC activist Sally Hebert as well as other people out of state who may have useful suggestions, including Farah on our staff who is especially knowledgeable about cases involving threats of forced cesarean surgery. I know a great deal about the law in South Carolina but am not admitted to practice there, so any legal questions should be directed to lawyers admitted to the bar in South Carolina. I can, however, share with you some general background. As a matter of constitutional law, medical ethics, and human rights, doctors may not force their patients — including pregnant ones — to undergo procedures they do not consent to. Appellate cases decided on full records and addressing the issue of court ordered interventions on pregnant women have held that the medical and constitutional principles of informed consent, bodily integrity, and patient privacy and autonomy require that pregnant women have the right under the common law and the constitution to accept or refuse medical treatment, like all other patients. See In re A.C., 573 A.2d 1235, 1253 (D.C. 1990) (en banc) (vacating a court-ordered cesarean section that was listed as a contributing factor to the mother’s death on her death certificate); In re Fetus Brown, 689 N.E.2d 397, 400 (Ill. App. Ct. 1997) (overturning a court-ordered blood transfusion of a pregnant woman); In re Baby Boy Doe, 632 N.E.2d 326 (Ill. App. Ct. 1994) (holding that courts may not balance whatever rights a fetus may have against the rights of a competent woman, whose choice to refuse medical treatment as invasive as a cesarean section must be honored even if the choice may be harmful to the fetus). Cf. Stallman v. Youngquist, 531 N.E.2d 355, 359-61 (Ill. 1988) (refusing to recognize the tort of maternal prenatal negligence, holding that granting fetuses legal rights in this manner “would involve an unprecedented intrusion into the privacy and autonomy of the [state’s female] citizens”). Nevertheless, South Carolina stands out in the nation for having judicially created law that treats viable fetuses as if they are separate persons. As a result, certain women have been found guilty of child abuse for risking harm to their unborn children. None of these cases in South Carolina, so far, involve women who have refused cesarean surgery. These decisions, do apparently embolden doctors to believe they can impose their view of what is best on their patients. Theoretically, it might be possible to go to court to get a Temporary Restraining Order –ordering the hospital not to do as they have threatened. If Susan or Rauch or another South Carolina attorney and the client wish to and are able to go this route, our office may have some draft/model papers that would help with such an effort and we would be happy to consult with/advise/share information with that lawyer. Regardless, however, of what rights this woman has on paper, she has to deal with the stress of this situation and ensuring that she has access to the health care she does need and want. I cannot advise on what medical course she should take. I can say though that, however she proceeds NAPW would be very interested in also exploring how we could help if she wishes to challenge these actions after the birth or bring them to public attention. Similarly, if child welfare is called,(something else that would not be supported by constitutional law etc– but is a scary, if remote, possibility) NAPW would be interested in helping her local counsel. I will be on a plane this morning, but my cell phone is below in the signature block. When it gets a bit later, I will try and reach some of the South Carolina folks by phone to give them the heads up about your email. Please, in any event, let us know what happens. We will be worrying about this Mom. Thank you everyone – especially Jen – for uplifting this mother in your thoughts and prayers and helping us join together as a community to help this wonderful mother out! Last night, four wonderful women got together and composed a letter to the mama’s OB/GYN practice. These women were members of ACLU, ACLU Women’s Rights Project, National Birth Policy Coalition, and National Advocates for Pregnant women. Thank you so much Jen for contacting these women on the behalf of my client and myself. The letter was absolutely wonderful and explained in detail the things the practice were doing were wrong among many other things – it was very detailed!!! The letter was faxed to the practice first things this morning and a copy was sent to myself and my client. When we arrived at the consultation, the practice had already received and read the letter and it was in my client’s chart. We were ushered directly to the OB’s office instead of an exam room. We sat down and began to discuss the issues at hand. I was providing moral support while my client took the lead. The OB explained that he believed this was all simply miscommunication. He said that while they have very strong feelings on things such as this, they could not and would not force her to do anything and that no one would come and drag her out of bed tomorrow for her scheduled cesarean. He said that this was clearly a misunderstanding and miscommunication and that it didn’t deserve legal attention. That right there tells me that the point and purpose of the letter had worked!! I knew when I read the letter that it was either going to upset the practice tremendously and they would seek a court order for a cesarean, call DSS/CPS for her endangering her child’s life since SC is a personhood state, or something similar. Alternatively, the letter may shake them into reality and make them realize they are dealing with a mother who is fully informed of her rights and ready to take action and they would back down. Thankfully, the second option ended up happening!! You could tell it was obvious he was shocked that someone went to such lengths to get their attention and fight for what they wanted. He had the ACOG guidelines book on his desk bookmarked to the VBAC policy and showed us that VBAC after two or more cesareans is contraindicated and the ACOG doesn’t support it. He explained the risk of rupture was 1-2.6% after 2 cesarean section. He explained the risk and that if my client were his wife, he would advise she have a RCS. He was very calm and we remained very calm as well. He said that now the ball was in her court. When he was done explaining his position, my client began to explain hers. Her first question was the publication date for the VBAC ACOG guidelines he had looked up because she believed they were out of date. He looked surprised to be challenged and we took out my binder that had the most recent, revamped ACOG recommendation that is to allow a TOLAC in mothers with two prior low transverse uterine incisions. He was shocked and had no idea that the guidelines had changed…. No wonder our system is so in need of VBAC support – the doctors don’t even know their own governing body’s recommendation!! She explained that she understood the risk involved, but she also understood the risk of a 3rd cesarean section and all she wanted was their blessing to have a trial of labor. She explained that she wouldn’t hesitate to agree to a cesarean section should there arise a true need. They talked further and agreed that she would be allowed to be left alone until 41 weeks – March 17th (they have her EDD as March 11th) to go into labor and be allowed a TOLAC. No induction methods would be used. If no labor and no changing cervix by March 17th, a cesarean will be scheduled and the mom is ok with this. Everything looks great at her appointment – she’s had no cervical change and the baby is very high still – baby is floating according to the doctor. She’s going to work to bring her baby down and prepare her body for labor. She feels as if a weight has been lifted from her shoulders and she can finally relax. We both agree that being stress-free will do a world of good and we pray she goes into labor on her own before the 17th. Send her good thoughts and prayers that her body kicks into gear and decides it is time to have a baby!! I am elated that this took such a wonderful turn!! It was such a dark time for quite awhile! Thank you everyone for the continued support and I will keep everyone updated with the mother’s permission!! Hopefully she has a wonderful story to tell very soon! My problem is that there is only a one ob practice in my town, and the closest supportive doctor is farther away than a woman in labor can be reasonably expected to travel. Is there not some obligation on the part of doctors to not force women to seek care elsewhere, when they are the most reasonable, and really safest choice? My doctors have been very insulting to me, stating outright that they won’t “allow” a trial of labor, as if it were their choice to make, because I might sue them. Not because of my health, but because of their lawyers. Why aren’t they more worried that I’ll have complications on my three-hour drive to the only doctor who will “allow” labor, and then suethem for refusing to treat me, thus causing me to be without care at such a critical time? I’m not good at advocating for myself, and this would be my 4th c-section, so I am really timid, and they are really, really adamant, and I feel helpless. I’m convinced that a trial of labor holds less to fear than a repeat cesarean and all the attendant scarring and potential for complications. After lots of research, at this point it’s the surgery that I’m more concerned about, for a lot of reasons. I’m sick of being told that I have to do it the doctor’s way because SHE is scared of losing control of the situation. She’s not the one that has to live with the decision I make. *I’m* the one who is scared, and losing control of my own body. I’m not sure what kind of answer I’m hoping for here. Maybe I’m just venting. Right now, I’m 20 weeks, scared, and powerless. What am I supposed to say to them? I posted your question here and received a variety of ideas. I’m sorry you are in this tough spot. I hope you are able to connect with a supportive provider. Sorry, but I still cannot read the letter. When I download it from your link and the ACLU site it is five pages with a big red x on each page. Am I doing something wrong? I’m so sorry you are having this problem! I just viewed the letter without issue. Maybe try just clicking on the link and having it load in your web browser and then try to download it? Regarding the Pit and rupture…the package insert for Pitocin says that a level of 6 microunits per minute is equivalent to natural labor…and truly, in my experience working with laboring women…a care provider willing to stay at 4 microunits is VERY RARE. I’ve seen women as high as 18 microunites/minute, and I’ve been told that some Dr’s will go as high as 30! Why has the letter been redacted? I truly wanted to see it. Identifying information was redacted for the privacy of the mom, her doula, and the OB practice. All the case law and vital information is still public. I also don’t think it is wrong to say that the outcome of an abruption or rupture would have been worse at home. These are both rare occurences which we KNOW need immediate intervention to save the baby. Even a 30 minute “decision to incision” time is not sufficient here. http://journals.lww.com/obgynsurvey/Abstract/2011/12000/Vaginal_Birth_After_Cesarean_Delivery__Risk_of.2.aspx There is also good evidence showing that induction and augmentation do increase rupture rates. The evidence is truly mixed. Moreover, while augmentation has risks, prolonged labor ALSO increases the risk of rupture. Augmentation doesn’t seem to be a major risk factor for abruption, in my reading. I am running into a similiar situation but the details are slightly altered. I am 35 weeks and my doctor says he will terminate care if I do not consent to a section by Wednesday. His tone has been abusive since November and now I am being left without care and on the hook for his bill for the visits I have had. I am reeling from this and hope to get in touch with someone who can help. I am so sorry you are in this spot. The first thing I would recommend is to review your options and see if there is a VBAC supportive care provider within a reasonable distance of your home. That would be preferable to trying to VBAC with a care provider who is not supportive. Get a copy of your medical records & operative report from your first CS, get the names of VBAC supportive providers, and ask the right questions. Read more about planning a VBAC. Since you are 35 weeks, I would also recommend using the contacts listed in the article above, specifically Mie Lewis, and get her opinion of your situation. As the weeks tick on, your options reduce. What state/area are you in? Thank you for your advice and kindness. I have worked out a legal agreement with my doctor to mutually terminate my care. Now I am excited that I will be having a home birth! Thank you for this site. It sometimes seems like a very lonely journey to VBAC – one in which there are many against you. I have gained strength from other VBAC moms and look forward to soon joining the ranks. Your insurance will pay at the normally contracted amount. Some of the Dr’s who use this tactic really do believe it to be true because they’ve heard it from other Dr’s, but some are just using it as a manipulation tactic. Regarding the 2009 Zwart study, did the authors report the total number of women who were augmented/induced (whether they ruptured or not) and the total number of women who were NOT augmented/induced (rupture or not)? The 62.5% number calculated from the number of ruptures during spontaneous delivery doesn’t really tell us much about the risk of rupture with augmentation or induction. For example, if 58874 of the 358874 women received induction/augmentation, then that is a VERY different risk factor (2.07%) than if, say, half received augmentation/induction (0.00018%). Yes, 63% of the ruptures occurred in spontaneous labor, but is that just because there were many more spontaneous labors than augmented/induced labors? In order to really make any sort of intelligent conclusion about the risks of induction/augmentation for uterine rupture, we must have the figures for how many women were induced/augmented, and how many of those ruptured, vs how many were not induced/augmented, and how many ruptured. Regardless, it is not my intention to second-guess this mother’s decisions or outcome. I am very glad that she feels comfortable with how things turned out for her, and glad that both baby and mother survived. While we know that there are 332,885 unscarred women included in this study, we don’t know the number or percentage of unscarred women who were induced. We need this information in order to calculate the rate of uterine rupture in induced, unscarred women. So I did a little looking and I found Verhoeven (2009) which states ” In The Netherlands induction rates have remained stable over the last decades at approximately 15%.” Since the induction rate has been stable, and this study included 97% of births in The Netherlands between August 1, 2004 and August 1, 2006, I feel comfortable using this 15% rate of induction to calculate the rate of uterine rupture in induced, unscarred women. So when we take 15% of the 332,885 unscarred women in the study, we get 49,933 induced, unscarred women. However, it was unclear if they induced the same percentage of scarred moms, so I did not feel confident applying the 15% induction figure to the scarred women in this study. 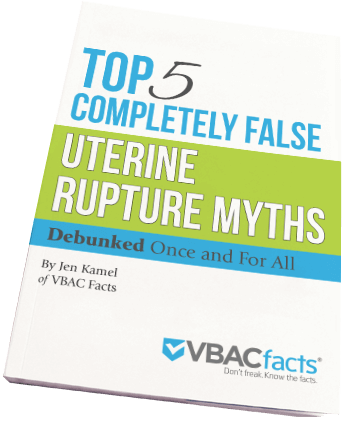 It doesn’t tell us the rate of induced scar uterine rupture, but it does debunk the myth that only induced/augmented labors can result in a uterine rupture. Landon (2004) does share rupture rates by spontaneous versus augmented versus induced labors, 0.4% (N = 24) in spontaneous labors, 0.9% (N = 52) for augmented labors and 1.0% (N = 49) for induced labors. Read more. You can read more about the Zwart (2009) study here and here. I am so, so glad this mom got the support she needed, the options she chose for herself, and the kind of respectful and competent care that we all deserve. Bravo, Jen, legal types, doula, doctors…and most especially, Mom. I am so happy for you that you were well taken care of, that you were able to go into labor on your own as you’d wanted, that you didn’t have to stand alone, that the people whose job it was to take care of your health (eventually!) decided to do so. I’m sorry you had to go through all of these hoops, but so glad you stuck to your guns, and so thankful that, even with that kind of what-are-the-odds emergency, your sweet baby is here with you safe and sound, and that you were treated gently and respectfully in the hospital. Please don’t mind it when silly people try to turn it into a game of second guessing…you made thoughtful choices for yourself. If it helps to know…I’m 31 weeks pregnant, planning a VBAC, and your story, every single piece of it, has helped me. Thank you for sharing your experience. Just going to disagree with one thing. While mom might be glad of her choice, and therefore it was right for her, and while you might have a story of a mom whose baby died from a home birth, it does not logically follow that if this mom had been at home, her outcome would have been worse. Would it have been better? To say yes is as foolish as to say it would have been worse. I had midwives deliver me without continuous monitoring and yet, they were quick to detect a decrease in my baby’s heart rate (which is what clued them in at the hospital). So, who know what would have happened? BUT, if she had gone illegally to an underground midwife (this should not be something women are forced to do. They should be legally able to chose who attends their births), then, because of fear of unlicensed or illegal status of the birth situation or the midwife, then it would be riskier because people would be considering something besides health of mom and baby (weighing the risk of legal trouble vs. the risk of true health issue.) This is why woman need to be allowed to chose their birth attendants and not the state. That way, when trouble comes up, the only thing to consider is mom and baby’s health!!!! Good work for this mama. How could her outcome not have been worse had she been at home? Her baby was without oxygen once the placenta detached from the uterus. While I’m not a huge fan on CEFM, if she didn’t have that, and they were just checking sporadically, who knows how long the baby would have gone without oxygen before the non-existent fetal heart tones were noticed? In the home environment, how long would it have taken to detect the baby’s heart stopping, transfer to the hospital, mobilize the OR, and start surgery? A lot longer than 10 minutes. In this situation, with this mom, it’s quite likely her baby would have been born with brain damage or died had she planned a homebirth, especially if she had a midwife as inept as the one who attended Aquila’s birth. In terms of your experience: There are many reasons why a baby’s heart rate would change. It’s my understanding that some are more urgent than others. But a change in heart rate is very different than the heart stopping. Her baby’s heart stopped, so it was urgent and time sensitive. I’m really, genuinely trying to understand where you are coming from. Help me understand. PS – I should add that I had a homebirth after cesarean and a post-partum hemorrhage. That is something that midwives with the right drugs, such as Pitocin and Methergin, can treat at home without needing to transfer. I would be interested in hearing how a midwife would treat a placental abruption at home. It’s my understand that you would need surgery and it’s that transfer time to the hospital that makes everything risky as baby is going without oxygen the whole time. I just read the update!!! Such wonderful news! She will be in my prayers that she will go into labor on her own before that date. Whatever happens though, I’m sure she feels she has now done all she can do, and she has stood up for a good cause! She must feel great about that! If this ends with a vaginal birth, that will be the absolute icing on the cake. Good work mama! The NW Women’s Law Center project referenced in the first comment is no longer in effect. Just wondering of the outcome…have had you in my thoughts and prayers! Did you see the latest update of 3/6/12? Thank you! She has your contact info! Please let us know the outcome after she has baby. I hope all goes as desired! We are blitzing all local OB/GYN offices today and hoping we find another doctor to take her. She’s under a complete bucket full of stress right now. Please send all the love, light, prayers, and relaxation vibes to her. Thank God I live in Canada! Awesomeness! Such great support and rallying around this mama who we all know is one of way too many. The internet is an astounding tool and I am grateful for websites such as Jen’s and facebook groups like Birth Professionals International where we have been discussing this case. Along with all the other fantastic suggestions, I would like to suggest that the mother and doula be in contact in advance with the patient advocacy person at this hospital. If she births in the middle of the noght or on a weekend, this individual might not be in-house. Establish contact now and get after-hour contact numbers. Birth well! I was forced to have my 3rd c/s at a hospital. I was in labor and asked the resident, what if i refuse a c/s, the resident replied that i would have to leave. I did not know then what i know now, that legally they cannot do that. I had my vbaccc in a different state. Im planning homebirthing my next because no one here will let me vbaccc again. The mama needs a supportive doula (sounds like this doula is) to act as a buffer. I would take a copy of the act that says all patients must recieve treatment to the hospital (forget what its called), also be leary and completely read everything she is to sign. On a vbacc consent form at the hospital i was forced to have my 3rd c/s at one of the statements says i agree that the drs and staff may do whatever they deem necessary to me in regard as a patient, and yes thats exactly what it says. Dont go in with fists up but be prepared with all the legal papers to back you up. Bring in ACOG guidelines, bring in stats for vbaccs and stats for rcs’. Also write the practice a formal request for records, have a copy hand delivered to the practice and bring a copy of that letter to the hospital. I would almost venture to say, see if you can get a lawyer just to go in the hospital with you, so they cant dish out the lies. The drs within that practice may try very hard to make things miserable and difficult for you. My worry would be a cps call. I pray that doesnt happen. If it was me, id stay home and birth, i know its scary, i walked that road, even with birthing in a hospital, but this practice seems extremely combative and my concern is the repercussions of vbaccing and them taking the baby. At the very least stay home as long as possible. Stand your grounds, confidently and respectfully. Go in at the very last moment labor at home as long as possible. Know how to listen to FHT at home and keep positive thoughts. The moment you walk in there the “fight” will begin and her body will react to it, slowing or even stopping labor. You can and will do it! My thoughts and prayers are with you guys. Hope Mama got the birthing experience she been wanting. (crossed fingers). Because I know her story will strengthen my hope to get mine, and to know for sure it is possible…..GOD BLESS! I can not thank Jen enough for being the amazing resource she is and for all the wonderful, helpful comments. I am the mother in question’s doula. So that no one is worried over confidentiality issues, I have explicit permission from this mama to discuss her case and the details to be able to offer her the most help and exhaust all of our resources. The practice she is with is known to be “VBAC supportive”. I’ve attended numerous VBACs with this practice – including VBA2C’s and have never had an issue such as we are having now. I’m at a loss as to why the sudden turn – a classic bait and switch. We are taking all of this to heart – the mom is showing some signs of her body preparing for labor, so we hope and pray it is soon. The current game plan is to remain at this hospital and depending on the doctor on call when she arrives, she may or may not request a resident on ‘in house’ OB instead. She knows her rights – and was made even more sure by all the wonderful information given here and on various Facebook pages where Jen shared her story. Along with her birth plan which explicitly states she refuses to consent for a RCS unless there is a medical emergency, we have printed out the ACOG’s VBAC stance which is to allow a TOLAC for a women who has had up to 2 previous c/s, the legal rights to refuse a c/s and the the fact that they have no legal right to force her (an awesome FAQ from ICAN), and several other things to present if needed. I believe we’ll ask for a patient rep/ patient assistance coordinator/patient advocate when we arrive and inform them of the past issue and what is going on and what she does and does not want. Again, thank you for the unending support. I will most certainly keep Jen updated and I hope that soon she’s able to announce the joyous success of this mother. I meant to say the Willie Barela equivalent in your hospital. I am amazed at the power of women on the Internet! 12 hours ago this mama was probably feeling lost and along and backed into a corner. Now she has legal counsel interested in her situation and case law to quote to her dr. Thank you, Jen, for making this site such an incredible resource! Emily, I got goosebumps this morning thinking about it. The Internet really is such an amazing thing! I hope this mom has a good outcome! Another option is to find an independent ombudsman. It’s ideal if you could get your records that say you were a good candidate for VBAC before they changed their mind. The patient assistance coordinator has no connection to the doctors, so they wont get in trouble for causing a stink. The more people you have on your side the better. I hope all goes well. GOOD LUCK! What disturbs me is that they would wait until she is almost term to finally disclose they were unwilling to allow VBAC. That is incredibly manipulative not giving her much time to find another provider. Great advice given above. I hope this woman can have an incredible birth, and it saddens me she is going to have to fight so hard. I sure hope she can get what she wants. GOOD LUCK! Since this practice was known to be supportive of VBAC and VBA2C, I suspect that they had a recent bad outcome/ uterine rupture/ lawsuit that resulted in them changing their policy so suddenly. A doctor cannot refuse to treat you unless they want to be sued or have disciplinary action taken against them. If a doctor tries to coerce or refuse treatment you should ask to see the appropriate staff to file a formal complaint immediately. The problem is that doctors think they are smarter than everyone else (patients, nurses, other hospital staff) and that their word is the law AND patients let doctors and medical practices bully them. Patients typically don’t know their rights and the doctors use that against them. They act like they can refuse to treat you to get you to do what they want. chapter.director@ican-online.org I don’t know why her email did not show up above but here it is! Hi. I’m the leader of the ICAN chapter closest to this lady, and wanted to leave my email address in case she would like to contact us – jennflavored@gmail.com. I don’t know much about hospitals in that area, but the laws are the same statewide. She can show up to the hospital pushing and SOMEONE must treat her. She may fire her doctor if he is on call and request another one. Most likely she would end up with a resident who doesn’t know her, but can request her records. She does not have to be treated by this practice and CANNOT be sectioned against her will if she declines. No one can invade your body with anything without your consent. If they continue to push her, make sure she repeats this statement over and over again – I DO NOT CONSENT TO SURGERY. Try to get in touch with other doulas and midwives in your area and see if they have any advice for working within this particular hospital or recommend a better one. If she’s worried about her records, she can go to the office and request them herself and have them on hand for the birth. Good luck! OK So I know, in person, many Moms who have changed providers for the same exact reason. One Mom even changed over the weekend while she was in labor! All of them went on to VBAC! Then I also know some Moms who wanted to VBAC but were told they could not go past their due date. All of them had a RCS and many had babies that were 7lbs. There is no study or abstract that I have ever read that showed more rupture risk after 41 weeks! I don’t have a lot of info to share, but one thing they CAN do is refuse her any pain mess (even if she asks for them). The doctor on call can refuse to treat her unless she submits to the CS. Which might not be bad for a vacation, really. Anyway, that happened to me so I know it might happen elsewhere. Our mama wants to talk to someone who has won the vbac battle in a bad situation, I’d be more than happy to talk with her. Emily dot moothart at gmail dot com. I’m a lawyer with the Northwest Women’s Law Center in Seattle. I’m investigating possible legal responses to bans on vaginal birth after cesarean at hospitals in the northwest states – Alaska, Idaho, Montana,Washington and Oregon. If you are currently pregnant and want to have a VBAC, but are facing a hospital policy that would require you to have a c-section regardless of whether you want it and whether it is medically necessary, and are willing to consider working with a lawyer on this, we’d like to talk with you. Please email us at vbacbanhelp@ican-online.org. Our services will be provided free of charge. I hope it’s still valid, and this woman can find help.